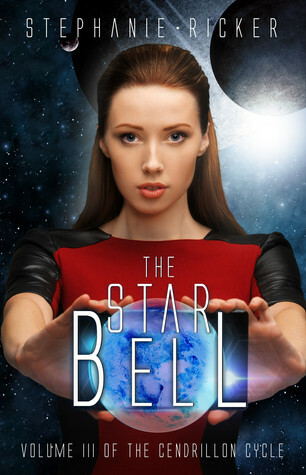 The Star Bell is the third book in The Cendrillon Cycle. The first two, The Battle of Castle Nebula and A Cinder's Tale, were both excellent reads, so I was greatly looking forward to reading this one, and I wasn't disappointed. General Impressions: This book was quite a bit longer than the two previous books. This I think was a good thing, because it meant there was a longer time to enjoy the book. It also allowed for more development of the story, especially plotwise, and greater worldbuilding. I have to say that I don't think I enjoyed this one quite as much as the previous books, although I couldn't say exactly why - I think it just had a lot to live up to. However, that doesn't mean that I was disappointed in it - The Star Bell is still a really good book, and I very much enjoyed reading it. Characters: The main characters are Elsa, Bruno, and Karl, who are of course already known to readers of the previous two books. As in A Cinder's Tale, one of the things I really liked about this book are the close relationships between the characters, particularly Elsa and the rest of her (now ex-) cinder crew. Although this shows a bit less in this book since some of the characters are not around all the time, it's still there; we still get to see all of the old characters again, and there are some good new characters too. All of the major characters are interesting and well-drawn. Plot: Since this book was longer than the others in the series, this allowed for much more plot development. This was definitely well done; the story kept my interest all the way through, and there were certainly some unexpected twists and a few tense moments where I was anxious to keep reading to find out what would happen next. Worldbuilding: This is one of the highlights of this series for me, and one that is developed further in this book. The world the stories are set in is detailed and believable, but things are explained throughout the story so you don't have to wade through long descriptions or explanations. Often we are finding out things along with the characters, especially since this book includes the exploration of a new planet. I think the worldbuilding really contributes to the entertainment value of the book, and there are some little touches that make the world even more believable - for example the changing of figures of speech to represent things the characters would be familiar with - "snowflies in the stomach", "chuck the engine out with the synth-oil", "wild hunds couldn't keep me away," etc. Romance: I liked how the relationship between Elsa and Karl developed slowly; at the beginning they still don't know each other very well and aren't sure how they feel about each other or whether being in a relationship is what they want, although there is clearly a sense of attraction and the possibility of romance. The development of this through the novel is slow and it isn't the main focus of the novel, but it is still there, and I liked how their story unfolded. The Ending: This was good. I won't say much about it obviously, but I will say that the ending satisfactory as an end to the story, but is open enough that you still want to read more to find out what happens next (hopefully a sign that the series is going to continue!). Overall, I really did enjoy this book. I would recommend reading the first two books in the series first, but if you've read those then I would definitely recommend reading this one!